Sundry accessories: Grand Prix Audio APEX footers, Acoustic Revive RR-77 ULF pulse generator, Isoclean fuses, Caig Pro Gold, Auric Illuminator, Skylan damping boards, Audio Magic/Quantum Physics Noise Disruptors, dedicated AC line with Wattgate 381 outlet, Echo Busters acoustic room treatments. Room size: 11 x 18 x 8', long wall setup, suspended hardwood floors with large area rug, walls are standard drywall over Fiberglass insulation. Review Component Retail: US$1,199 each. 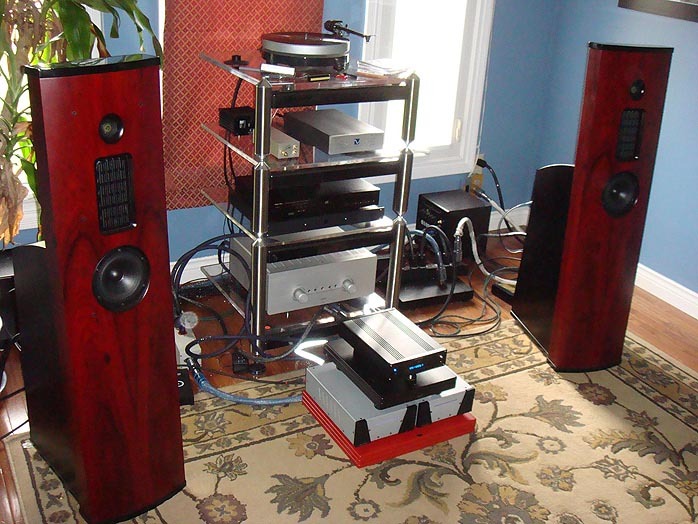 This past summer, I have been living it up with a pair of kilowatt class D monoblocks from California-based newcomer Wyred 4 Sound. Who is Wyred 4 Sound? While the firm may be new, the guiding hand behind it, Rick Cullen, has a résumé that stretches back to the early days of PS Audio and to 1990 with his own firm Cullen Circuits that specializes in providing OEM work for several high-end audio firms as well as a modification service. The W4S brand now allows Cullen Circuits to design and market their own product line. Darn impressed with Cullen's Level 3 mod for PS Audio's DLIII DAC I wrote up last year, I was keen on hearing more from this team. Wyred 4 Sound offers three mono amp models: the SX-250, SX-500 and SX-1000 as well as several stereo and multi-channel amps. My review loaners were the SX-1000 monos rated at a whopping 1.140W into a 4-ohm load. This pair of lightweight compact boxes does not look at all like traditional high-wattage solid-state bruisers. By using switch mode power supplies, the bulky transformers, massive heat sinks and beer can sized caps of a similarly rated linear design are unnecessary. Each amp measures 8 inches wide by 4 inches high by 13 inches long. The casing is a rather utilitarian two-tone steel gray and black with a pleasantly muted blue LED on the front panel to indicate power status. Around back, there is a pair of plastic-shrouded WBT binding posts, RCA and XLR inputs, a power switch and IEC inlet. A small switch flips between the two inputs. 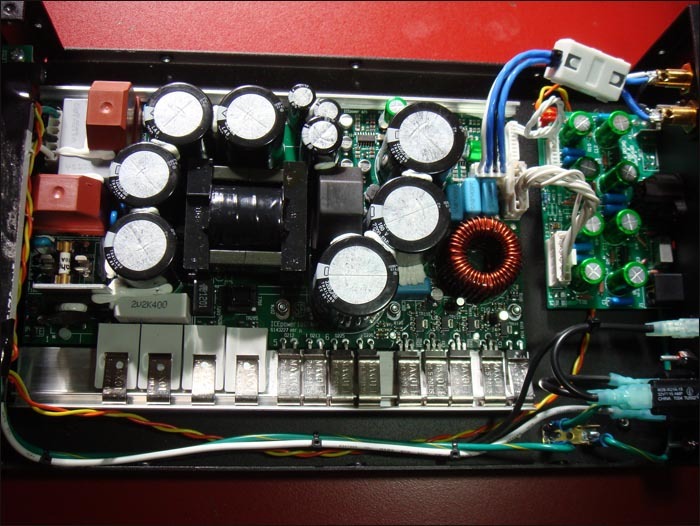 The SX-1000 outputs 570 watts into an 8-ohm load at .2%THD+N and 1,140 watts into a 4-ohm load. 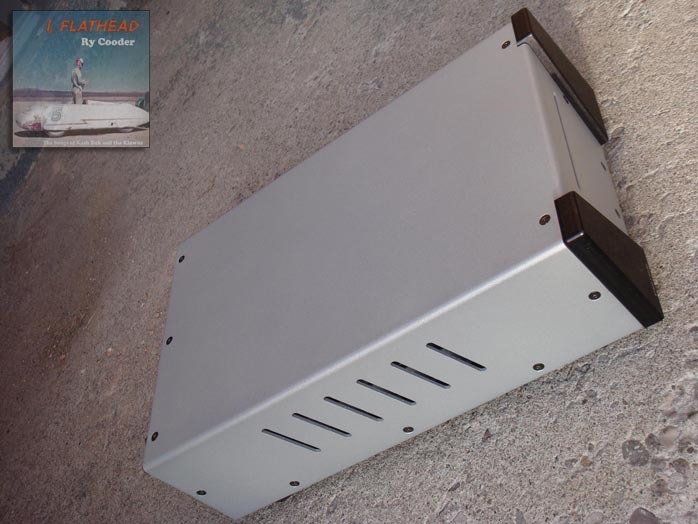 Further specs include: IMD distortion of.0005%, transient intermodulation of 005%; output idle noise of 80uV; efficiency into 4 ohms/1000 watts 79% and 78% into 8 ohms and 800 watts; frequency response of +/- 0.4dB 20Hz to 20 kHz; cut-off 3.3Hz into all loads; input impedance 61.9K; dynamic range 118dB; gain 27dB; sensitivity 2.95V; output impedance 5 milli ohm; minimum load 2 ohms; damping factor 2000 at 100Hz and 8 ohms; and max output current of 40A. Most class D amplifiers use off-the-shelf modules from firms such as Hypex, ICEpower and Tripath. W4S chose Bang and Olufsen's ICEpower analog switching power modules; in this case, the 1000ASP board, which I believe is also used by Bel Canto and Red Dragon and Jeff Rowland. Rather than just place the stock board into a fancy chassis and jack up the price, the folks at W4S discovered that they could improve the module's performance with additional circuitry and modifications. Under the hood, I noted several components on the stock board swapped out. Even the fuses received attention. Instead of the standard glass-body fuse, a gold-plated OFC Critical Link fuse (distributed by PS Audio) is installed in each mono amp. 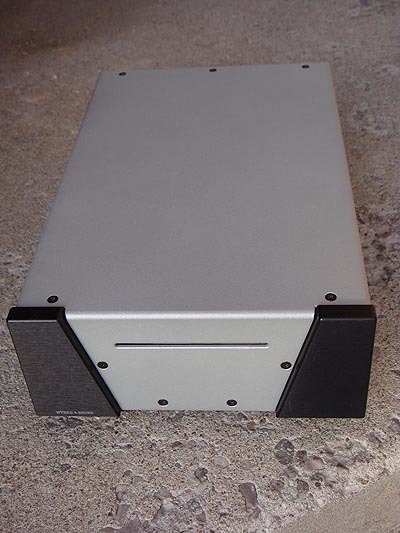 Furthermore, the SX-1000, as do all Wyred 4 Sound amplifiers, features a proprietary direct-coupled dual balanced FET input buffer stage with zero feedback for greater compatibility with difficult low output impedance sources. Hence the whopping 61.9K input impedance. All input and output wiring is a combination of stranded OFC and silver wire. Additional RF suppression on each output eliminates potential RFI issues. Each input stage features dedicated dual-filtered power supplies using low equivalent series (ESR) Muse capacitors. All signal path resistors are hand matched Dale Rn55d copper-leaded non-magnetic units. Incidentally, the 1000ASP board features soft start-up and comprehensive protection including thermal, over current, under voltage and high frequency. However, the real kicker in all this is the price: $2,400 for a pair of kilowatt monos! Why so affordable? Blame the Internet. 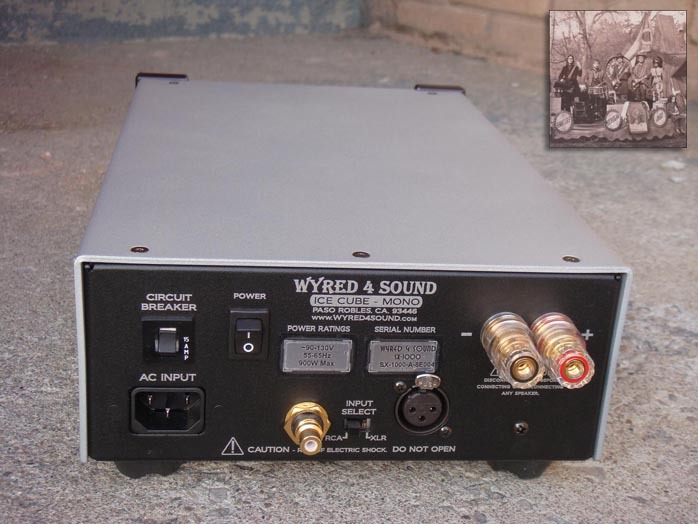 Since Wyred 4 Sound products are available only through their own site and Underwood HiFi, prices can be set lower by eliminating the markup of a traditional brick & mortar dealer network. It's a business model that's becoming increasingly common for a variety of complex reasons. Furthermore, due to the use of switching power supplies, the large, typically expensive transformers of traditional solid-state amps are not required. I drove the monos with my Manley Labs Shrimp preamp and direct via a Shanling PCD3000A CD player with onboard analog volume control. Unfortunately, my equipment only runs single-ended outputs so I could not sample the SX-1000s' balanced input circuit. Speakers included my Green Mountain Audio Callistos and AV123's Strata Minis, the latter incidentally a terrific match with the monos. I tried various power cables and eventually ended up preferring Audience's new 'e' series powerChord, which has yet to screw up the sound of any amp. While the rather industrial looking cosmetics were not exactly to my taste, build quality inside and out was exceptional. Both amps ran flawlessly and trouble-free during the review period. In addition, as switch mode amps run roughly 90% efficient as opposed to the 20% of class A designs, the casings simply refused to warm up regardless of how hard and long I drove the amps. Moreover, they only draw a few watts at idle. Tree huggers take note.